Run dtSearch on a Mac, or Linux? A few minutes researching dtSearch online will make it clear that aside from a few developer SDKs (UWP, Linux, Mac, iOS and Android), the dtSearch range of products is exclusively a Windows application. If you use an operating system other than Windows (we’ll focus on MacOS here), you may think that you are deprived of dtSearch’s unique ‘off the shelf’ ability to search huge document repositories instantly, seemingly at the speed of light. Use the free VirtualBox (MacOS and Linux) or buy either VMWare Fusion or Parallels (MacOS; US$80 each, roughly R1 020 at the time of writing). This option gives you the full dtSearch experience, although you’d have to buy a copy of Windows and the VM (unless you use VirtualBox). Additionally, depending on hardware configuration, the performance may be adversely affected because both Windows and MacOS would be running simultaneously. If your computer packs enough power to handle two operating systems running at the same time, and if the additional cost of buying Windows isn’t a serious hurdle, this option will probably provide the best all round solution. Other than installing the virtual machine application and setting up the guest device, all you need to do is share the host directories to be indexed. There are numerous sites and videos online to walk you through all these processes for the VM you choose. Like many enthusiastic, volunteer supported open source software, installation and implementation is not the simple plug and play process most people are familiar with today. Fortunately, there is an easier way: CrossOver is a polished version of Wine, developed by CodeWeavers. We have tested dtSearch through CrossOver, and found that it runs moderately well. Indexing and searching worked very well. We found that these key components (indexing and searching) worked very well for us. Some other aspects of the interface didn’t work as we would have liked. Using the drop down menu after right-clicking a result was frustrating and mostly ineffective. Clicking “Open” accomplished nothing. 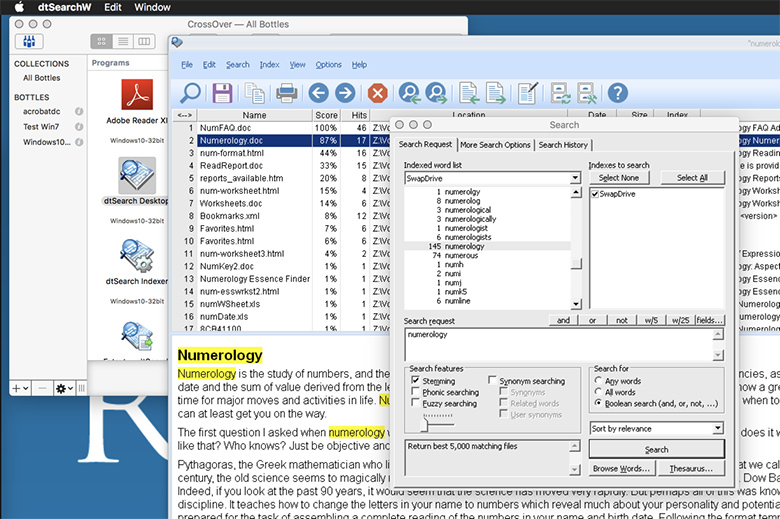 Selecting “Open Containing Folder,” however, opened a file window (called Wine Explorer) where the relevant file can be double clicked to open the file using the host’s default applications for the file type. In short, using Wine through CrossOver to run dtSearch is doable. It is less convenient than using a full-fledged virtual machine though. The upside is that it is lightweight and works out a lot cheaper. You’d save about R3 000 overall. CrossOver costs as little as US$40 (about $510), and you don’t even have to buy the Windows operating system. This one is a bit sneaky, however depending on the requirements, it can work well. That said, it requires more tech know-how to set up and configure the server. 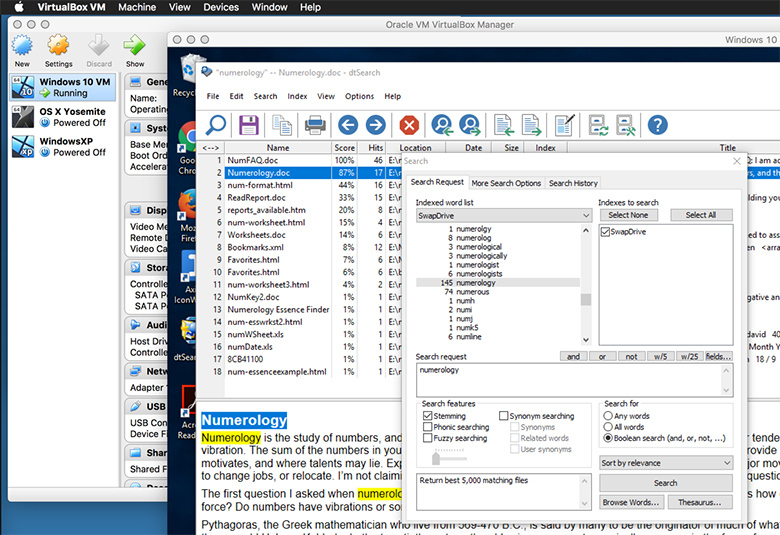 You can harness the power of dtSearch on any computer with a web browser connecting to a server running Windows/IIS and dtSearch Web with Spider. It definitely isn’t the cheapest option overall (by a long way). The benefit though is that an unlimited number of users are able to access the data at no additional cost. On a shared Intranet, you can search data from any device that has browser-based access. The individual operating systems and actual physical location are irrelevant. Interestingly, I first discovered dtSearch about 20 years ago in my quest to find a country-wide search solution. This led to an Intranet implementation just as described here. That system may even still be running today, 20 years later! If you have any questions or would like more detail about any of the methods described here, let me know about your project. I’ll do what I can to help you.